Growing up going to zoos and aquariums gave me an experience I couldn’t find in books. That’s why I was perplexed when documentaries boycotting the animal entertainment industry were being made. Children look at everything through a filter of innocent perfection. At eight years old, I was so naïve as my sibling and I took elephant joy rides in Thailand. At such a young age, how was I to know such places were not fun and games; they’re immoral. I wish I could go back and shake some sense into my younger self, but I realize that dwelling on the sad state of the animal world goes nowhere. Instead, I want to change it. Opened in 1963, the Santa Barbara Zoo is one of our small city’s best features. With the ocean nearby, mountains towering above, and the beautiful animals on display, the zoo is hard not to love. According to the American Veterinary Medical Association, the Santa Barbara Zoo adheres to all the requirements for a zoo animal’s adequate life. I’d argue that any regulations are fallacies. They are “right” in the eyes of the law, but I feel that morally, it is evil to cage wild animals, no matter the cage size. Visiting the zoo, I watched as the lions paced, gorillas ate their feces, and snow leopards shielded themselves behind rocks to avoid the relentless staring. And although many argue our zoo is far superior to others, that’s like comparing one prison to another. Browsing through the S.B. Zoo’s website, it boasts about its expansive 30 acres and 500 animals. What they meant by 30 acres includes the vast parking lot, retail stores, train tracks, offices, and kids playgrounds. I understand the zoo has a business to run, and it needs to keep their customers engaged in different activities throughout the day. But what about the animals? Why are the play structures coming at the expense of more room for animals? If the zoo truly cared about the welfare of their animals, wouldn’t the animals’ comfort come first? The zoo also claimed the animals are “exhibited in open, naturalistic habitats.” I found this shocking; the animals’ environments seem small and unstimulating. 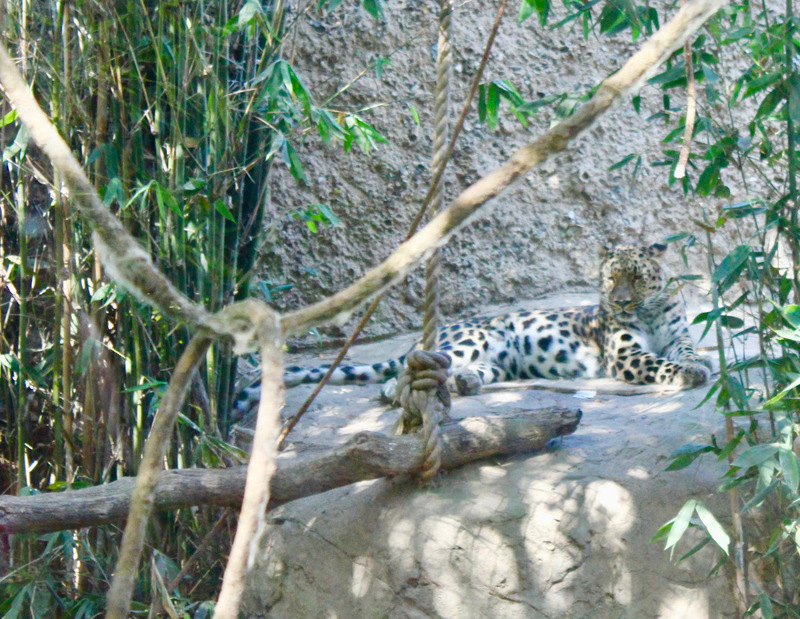 I noticed the plaque near the snow leopard’s cage, and I shuddered at the hypocrisy — a Himalayan snow leopard in Santa Barbara? When the summer weather kicks in, the zoo stated its solution is to “run the sprinklers” and feed them “special icy treats.” These efforts fall well short of recreating the natural blustery and freezing habitat of the Himalayas in a Californian beach town. Let me get off my high horse a minute and address some of the good that has come out of the zoo — most notably the island fox, FrogWatch, and California Condor Recovery Program. The California condor was the first species to be included in the 1973 Endangered Species Act. Fourteen years later, the entire wild population had diminished to 22 wild birds. By 1992, the first birds from the project were released and reintroduced back into their habitats. A program like this is what makes the supporters of the zoo think that all parts of the zoo are okay. However, I can’t dismiss all of the cons for a few pros. I cringed when I read that last line. Was that meant to be positive? Animals desiring to stay close to humans? To me, this signifies that these lions, tigers, and bears are no longer true wild animals. Block’s statement suggests that animals are in fact happy to be interacting with humans, which is contradictory considering the two species are predators. His dad, struggling to answer the question, ultimately ignored it. I realized then that within our young generation in this equally young century, we have the power to change what past generations have called the norm: captive animals. Just as Ringling Brothers closed their circus business after 146 years, the fate of the zoo industry rests in my generation’s hands. I can say with the utmost confidence that there will be a time in the future when zoos will be extinct. It may not be soon, but I believe that we will find a way to respect our fellow animals and let animals and humans coexist in harmony. Daisy Finefrock is an editor on Laguna Blanca’s The Forth Estate.